These are slides, notes, and now movies (!) from various talks I’ve given. Not all of my talks are represented here, but many are. Files are in PDF format, and more or less reverse-chronologically ordered. Pieri Maps and the bound Young quiver, based upon joint work with Ragnar-Olaf Buchweitz and Michel Van den Bergh, given at the Louisville KY AMS meeting in October 2013 and at the Winter Meeting of the Canadian Math Society in Toronto in December 2013. I gave three talks at MSRI in January/February 2013. They were recorded on video! I’m a star! Non-commutative desingularizations of determinantal varieties, the latest version of that venerable talk, given at the CMS meeting in Toronto, December 2011. This version is the first to mention the “quiverized Young lattice”. I gave a similar talk at the AMS meeting in Lawrence KS in April 2012. Wild hypersurfaces, based on joint work with Andrew Crabbe, given at the AMS meeting in Notre Dame, November 2010. I gave a similar talk at the AMS meeting in Lincoln NE, October 2011. Here are notes for an hour-long version, given as seminar talks in Lawrence (Feb 2010) and Syracuse (April 2010). Non-commutative desingularizations of determinantal varieties, notes for three seminar talks at Syracuse in January-February 2010. Semidualizing modules and Gorenstein presentations, based on joint work with Dave Jorgensen and Sean Sather-Wagstaff, given at the Winter Meeting of the Canadian Mathematical Society in Ottawa, December 2008. Here’s another version of the same talk, given at the Spring Meeting of the AMS in Urbana, March 2009, and yet another, given at the AMS meeting in Boca Raton, Halloween 2009. Non-commutative desingularization of determinantal varieties, a longer talk than usual (40 minutes) on the usual topic, containing more history and motivation than usual. Given at the international conference on commutative algebra in Yokohama, Japan, March 2008. updated: the file now contains some of the notes I made to myself for the lecture. Maybe that will be interesting to some. Non-commutative desingularization of the generic determinant, the latest and greatest version of that talk, given at the Rutgers AMS meeting in October 2007. The McKay Correspondence (coming soon). I gave a series of three seminar talks consisting of a very leisurely introduction to the MC, with emphasis on contributions of Auslander and on my current research. The notes need some fairly serious tidying up, but will appear here eventually. updated (March 08): looks like I won’t get around to tidying that file anytime soon, so here’s the un-tidy version: Notes on the McKay Correspondence. 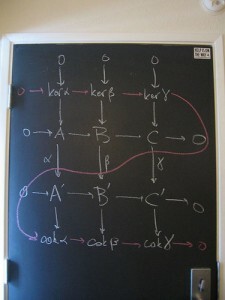 Non-commutative desingularization of the generic determinant, at the AMS sectional meeting in San Francisco, April 2006. This was my first attempt at using the LaTeX beamer class, which is a mega-super-awesome thing. I wimped out and printed the slides to transparencies instead of using the laptop, though. Coxeter-Dynkin Diagrams: A, D, and E, at the 32nd Annual New York State Regional Graduate Mathematics Conference. This is a purely expository, purely elementary talk aimed at first-year grad students. It was intended to give just a glimpse of the mysteries surrounding the Dynkin diagrams, in two of the contexts they arise naturally. Some will recognize parts of this talk as borrowed (with gratitude) from Idun Reiten’s colloquium lecture in Berkeley back in 2003. The Banach–Tarski Paradox, given in the Student Analysis Seminar at Syracuse, 31 January 2006. This was great fun to do. I basically reported on Stan Wagon’s book on the subject, emphasizing the algebraic aspects of the proof of BTP and its analytic consequences. Four lectures on local cohomology, given at the Snowbird Summer School in commutative algebra. I gave lectures numbered 3, 5, 7, and 12 out of the 24 total talks; the other lecturers were Srikanth Iyengar, Anton Leykin, Claudia Miller, Ezra Miller, Anurag Singh, and Uli Walther. At some point there will probably be a book, tentatively titled 24 Hours of Local Cohomology. update: I was right! Factoring the adjoint and MCM modules, an extended abstract for the hour-long talk I gave at the Oberwolfach workshop “Kommutative Algebra” in April 2005. People seemed really to like this talk, which made me very happy. Factoring the adjoint and modules over the generic determinant, a 20-minute talk that I gave at the Joint Meetings of the AMS in Atlanta, January 2005. The main reason I typed these slides, instead of hand-writing them, is that I wanted to see if I could pull off the typesetting on page 2 with horizontal curly-braces. I gave essentially the same talk at the AMS Special Session in Representations of Algebras in Santa Barbara, April 2005. Factoring the Generic Adjoint and MCM Modules Over the Generic Determinant, an hour-long version of the talk above, at the Banff International Research Station in September 2004. I was experimenting with a new format for my slides, so these are way more PowerPointish than I’m comfortable with. Bounded and Finite Cohen-Macaulay Type, an Introduction, a colloquium talk that I gave on job interviews in 2004. These were generally blackboard-talks, so the audience didn’t see these notes (and I could get away with saying things like “Mumble here about vector spaces…”). Bounding the ranks of torsionfree modules on curves, a seminar talk at Queens in November 2003. The talk was in Tony Geramita’s famous “Curves Seminar”, hence my fakey algebraic-geometry language. Finite, Bounded, and Countable Representation Type, an hour-long talk I gave in Hartshorne’s seminar at UC Berkeley in April 2003. Finite type: recurring examples, an hour-long “plenary lecture” at the Nebraska Regional Workshop in Mathematics, November 2001. I seem to have misplaced the graphs that went with the talk, so you’ll have to fill in the A-D-E plane curve singularities yourself.